Not all of us are lucky enough to live in the Niagara Region. That’s why we follow the AccessNiagara Blog. 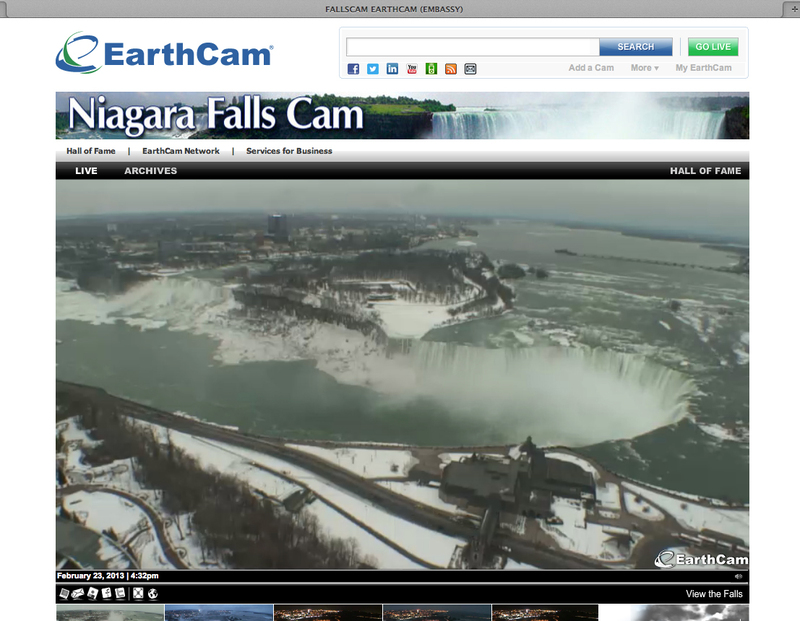 We also rely on webcams to get our daily dose of Niagara. 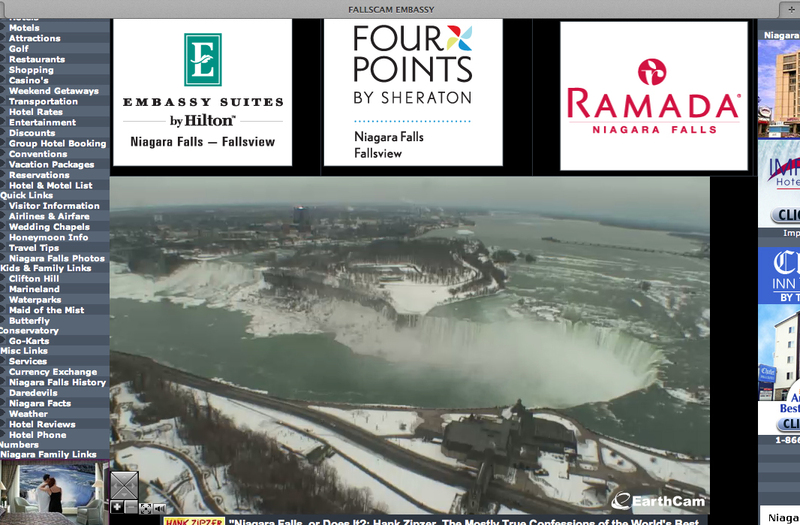 The first webcam I found was on top of the Sheraton Fallsview (which is now one of the many Marriotts in the area). It was a treat to see what was going on at any particular moment at my favorite spot on Earth. Is it sunny? Have the leaves peaked? Is there an ice bridge? Why is there a crane along the rail? Two views available. A link below the image takes you between the two. This one actually has the sound of the roar of the Falls. Live I suppose, but let’s face it – how would we ever know? Hosted by the Embassy Suties. Not the prettiest of pages – lots of ads and links, but a nice big picture – also with sound. Look familiar? Looks like the same feed as the Embassy Suites. I include it here if only because different streams might work better on different computers. Sound on this one, too. Another full river view. this one from the Crowne Plaza Hotel. This one is a bit different than the rest. Not a true stream, it states that the webcam feeds “updates every hour, 24 hours a day. The new webcam feed updates for 60 seconds. Then shows previous webcam feeds”. But what I like about this is that it pans. This is the latest in my collection. 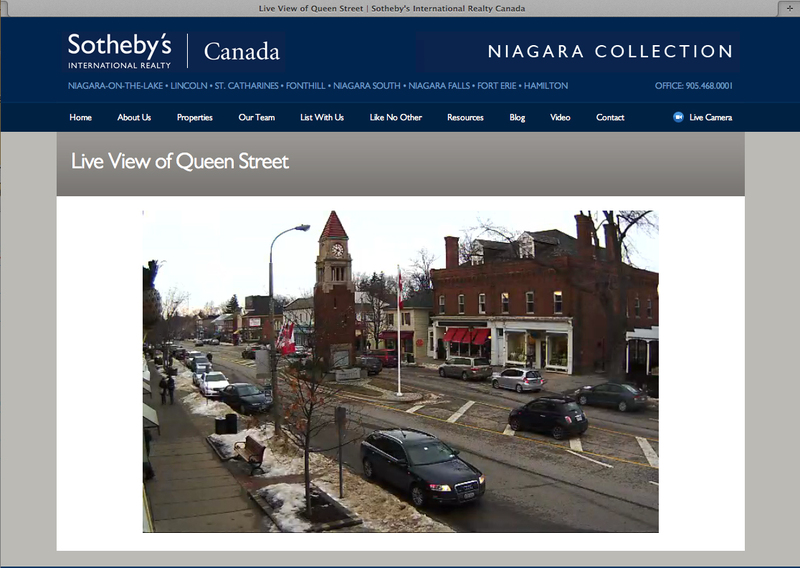 Found by my Mom, this is a Niagara-on-the-Lake cam provided by Sotheby’s International Realty! Odd combination for a webcam and business, but I love it! Sorry I couldn’t get a screen shot on a prettier day! I also enjoy browsing the properties. Let’s call it scouting for my vacation home so I’m ready when the Lottery finally comes my way. One interesting thing….NONE of these work on my iPad except the Niagara-on-the-Lake cam! Disappointing, because I don’t know why the other cams can’t figure out what Sotheby’s did. Maybe your tablet will have more luck. Well, there it is. If you’re like me and can’t be there – this is the way to go. If there are any that you know of that I missed, please leave them in the comments!